Happy new year! As 2019 begins, we’ve themed the latest issue of Digital Camera around photographing wonderful winter landscapes. Our cover feature offers hints and tips aplenty for cracking winter captures, plus we go behind the scenes on a winter photography masterclass in the Canadian Rockies with leading adventure photographer Mike Mezeul II. But if winter wonderlands don’t appeal, then our Photo Active section showcases 10 other projects to try today. Highlights include how to shoot a stunning seascape at dawn, and how to use low-key lighting to create the look you’ll see in a Renaissance painting. Our six-part series on astrophotography continues with a guide to creating a star trail, and we launch our latest shooting challenge: Around the World. Need some technical insights into photography? You're in the right place. This month, the ins and outs of ISO are covered in full, with an accessible six-page guide to this cornerstone of image exposure. Discover the correct pronunciation of ‘ISO’, plus how it can help out when shooting conditions may be less than ideal. This month, our regular Practical Photoshop section is packed full of advice to make your photos pop, including how to use the Whites & Highlights sliders for balancing out over-exposed areas, and how to apply dodge and burn black and white printing techniques in software. We also reveal how to use the 12 free Photoshop Actions included with the issue, and offer a tutorial on this month's free software download, Aurora HDR 2018. Also in the February issue, we share the best images from our latest reader Shootout, when two keen photographers searched out some fresh catches in North Cornwall fishing villages. We also discover the backstory to Homage to Humanity, a new book from professional photographer Jimmy Nelson that features stunning imagery of some of mankind’s least-documented indigenous tribes. 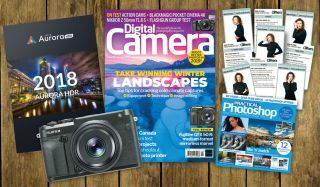 Camera, lens and accessory reviews in Digital Camera's latest issue include the new Fujifilm GFX 50R, which offers incredible image quality for the price. Lens-wise, it’s the turn of the Nikkor Z 50mm f/1.8 S and the Tokina Opera 50mm f/1.4 FF to grace our labs. Our group test puts eight flashguns up against each other, and yields a standout winner, while our two mini tests cover memory card readers and action cams. And if you fancy dabbling in video, then why not consider a dedicated movie camera, as opposed to a DSLR or CSC? The Blackmagic Pocket Cinema 4K costs just under £1000 and will give great results. Finally, our regular 'Help me buy a…' series turns its attentions to photo printers – check out our recommendations to suit all budgets.